After a long, bitter, snow filled winter and what seemed like a short lived spring, summer has officially arrived and it was long overdue, especially for those who live in the New England area. Along with numerous beach days, family trips and backyard barbeques comes the busiest event season of the year! Whether it’s celebrating the union of a loving couple, the new beginning of a recent graduate, a new addition to a family or the most patriotic day of the year, there is always something taking place every weekend of the summer. One of the biggest event trends this year, which will never go out of style in my opinion, is the use of bright colors. Using bright colors is a great way to liven up a space and looks even better in the summer sun! Color can be used within different aspects of an event whether it’s included in the invitations, linen, event space, flowers, or even the food. 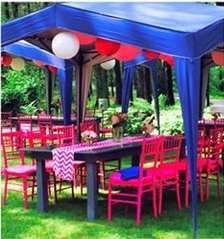 What better way to kick of the color filled season than with a blue and hot pink themed graduation party. 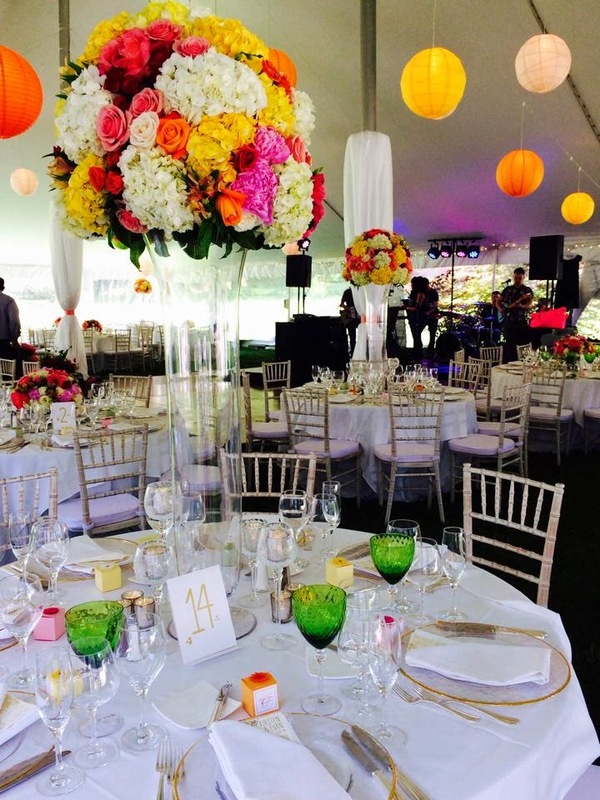 Who would have thought that a tent and those chiavari chairs could come in such magnificent colors? 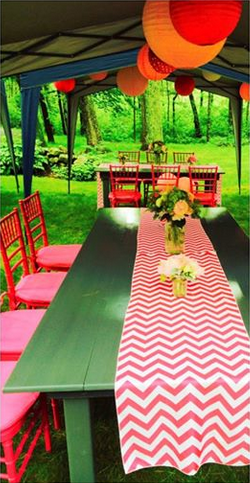 This bright blue tent was lined with pink and white paper lanterns which kept along with the color scheme down below. Chevron is another popular trend this season. Using a patterned table runner instead of a solid colored runner helps break up the color scheme without it becoming overwhelming. 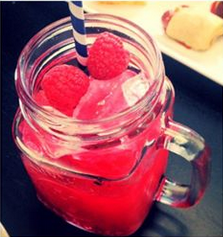 Another great way to add color to an event is by incorporating it in the food . If the using colored fabrics and décor may be too much color for you, using bright color flowers can also have the same effect of livening up a room. 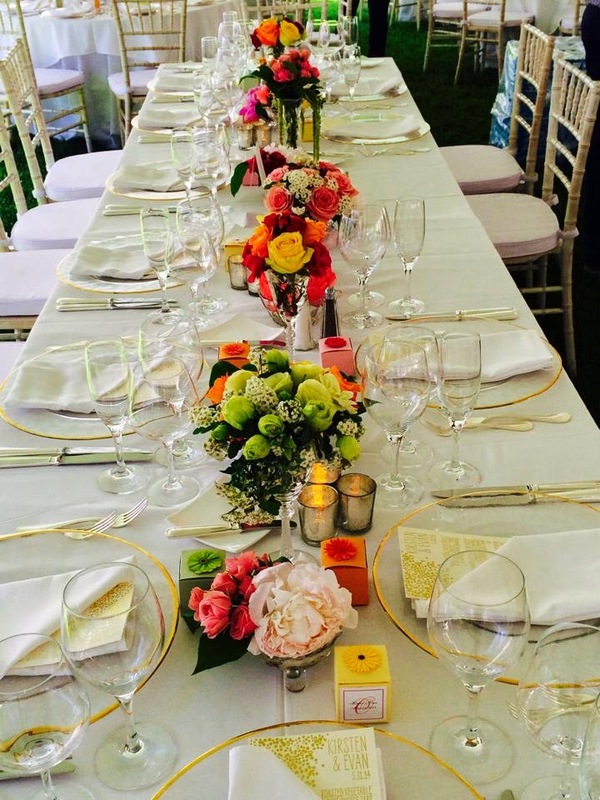 For a wedding at the Lyman Estate Bride and Groom Kirsten and Evan chose an elegant and classic color scheme for their décor, which complemented the historically estate, while using flowers, lanterns and water glasses to give a touch of color to the spacious tent. Our incredible team here at DME did an amazing job incorporating the elegance of the venue within the floral arrangements. The center pieces for this wedding varied in sizes for each table giving the tent a unique atmosphere. 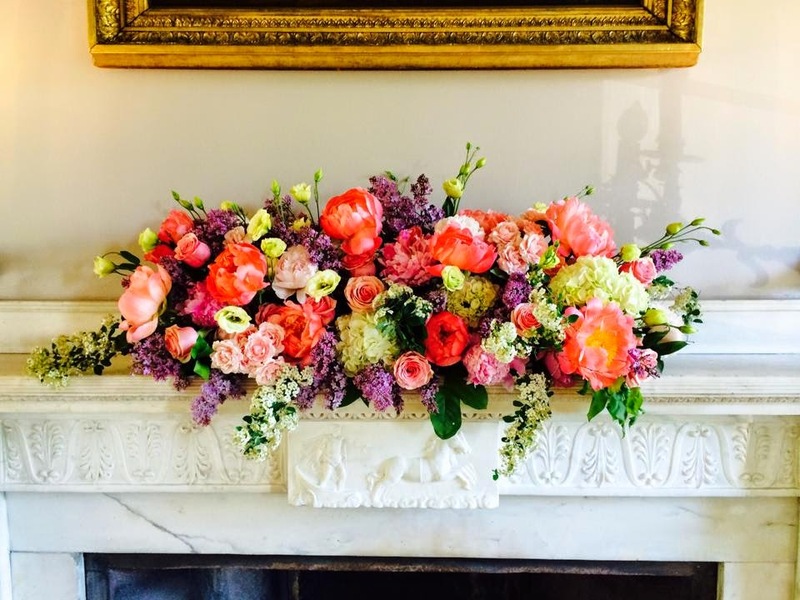 This beautiful mantel piece arrangement filled with coral, and blush peonies, white hydrangeas, lilac, yellow ranunculus gave the ornate white fireplace a splash of color against the grey walls. These small arrangements in vintage glasses provide several different color schemes to the elegant table scape. Adding several small centerpieces to a head table instead of a large arrangement provides more space for guests to sit and interact with each other. We here at Dana Markos Events are very excited for our action packed summer and we can not wait to see what this event season has in store for us.